Update: A full-length video of the show, which got a standing ovation, is now online. Get a bowl of popcorn, settle in and check it out. Come on Friday, Jan. 18, to a free performance of Climate Cabaret's original theatrical sketches and climate-adapted songs at the Unitarian Universalist Congregation of Princeton. Gather at 7:00 for light refreshments. Show starts at 7:30pm. Thanks to our generous Unitarian hosts for allowing us to use their Sophia Fahs Theater, a wonderful little theater which, among other things, long ago served as the birthplace of McCarter Theater's children's theater programming, under the leadership of John Lithgow's father. This will be Climate Cabaret's first performance in a space designed for theater. 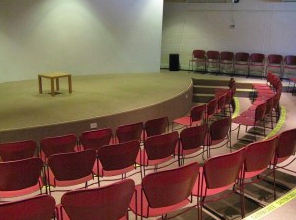 The UUCP's Fahs Theater is located at 50 Cherry Hill Road in Princeton, just up from 206. Joining me on stage are veteran actors Cheryl Anne Jones, Basha Parmet, and Fred Dennehy. Placing climate change in a theatrical setting can lead to unexpected insights about nature and human nature. Gain fresh perspectives on Carbon (a seductive renaissance atom, but beware--not all carbons are the same!). Witness a man's tragicomic breakup with his car. Explore Earth Logic in Space. Shakespeare's Titania comes by to warn about a "distemperature" in which "we see the seasons alter," and King George VI finds the courage to read The King's Climate Speech. The Tense Family argues about whether the future is imperative or conditional. A couple in a car speeding towards a cliff debate whether it's enough just to slow down. Written and directed by Steve Hiltner, these theatrical sketches combine with climate-adapted songs that speak to a deep love for a world whose wonders are perilously taken for granted. Within us are two competing urges with significant environmental and economic consequences. One urge is to purge, the other is to gather and retain. The purge reflex exports leaves and runoff from a property as expeditiously as possible. In so doing, it exports "problems", requiring the municipality to deal with the leaves, and downstream neighbors and communities to deal with increased flooding. The urge to gather and retain views leaves and runoff instead as gifts--a resource to be kept around, slowed down, and worked with. There's benefit in this perspective for plants and soil of course, but also for the municipality and those downstream. There are aesthetic advantages to the "gather and retain" approach that sometimes become apparent, offering visual pleasure even through this winter's long spells of gray. Below are photos taken of patterns in the ice of two miniponds, dug years ago in backyard clay. Quite apart from any environmental benefits, to make room for water in one's landscape is to become a patron of the greatest artist of them all.